Anobium Vol. 1 is the schizophrenic brainchild of Benjamin Van Loon—and the schizophrenia thing is rather literal, seeing as the issue is officially headed by Mary J. Levine, a fictitious product of committee thinking. Yes, the masthead lists an imagined entity. Intrigued? This simple quirk acts as a benchmark for Anobium’s ideology—the volume simultaneously takes itself seriously and has a good laugh. Think about it: a fake editor seems like an off-kilter joke for any self-respecting literary magazine, but in actuality it represents dedication to creativity and literary craft. The masthead itself is a testament to Anobium’s charm—character development exists across every page, even “boring” credit pages.With Friend, Chimp in Lab Coat The first volume is wrought with humor, but it’s also enveloped in poignancy, incredibly well-designed, and meticulously edited. The journal is able to successfully present a wide range of voices without losing the editorial tone, because it artfully shapes its tone as both the class clown and the chess club geek. Anobium reaches out to two extreme ends of the literary spectrum, and it does so brilliantly and without second-guessing itself. Susan Yount’s “Hyperbolic Umbilic Catastrophe” and “Spontaneous Symmetry Breaking” present narratives as theorems. Meanwhile, Stephanie Plenner’s “Instructionals” provides advice for literally burning bridges, cutting ties, and other idioms. Plenner’s piece provides a smart, linguistic look at everyday human experiences through an intentionally flat affect. It seeks to be staunchly rigid and serious as it deconstructs these idioms, and it does so in such a way that you can’t help but laugh (in a good way) and introspect. Such experimental pieces abound inAnobium. A series of pieces from Jonathan Greenhause hint at the contents of Sebastian’s Relativity, the first chapbook by Anobium Books, released this past November. In these excerpts, Sebastian is tied to a restraint table by chimpanzee surgeons, watches visible syllables land in heaps on the subway floor, and more. The magic realism of the pieces is intriguing, and each page-long entry has a distinct, microcosmic story arc. Without having read Sebastian’s Relativity yet, I wonder if Greenhause successfully pulls these micro-fictions into a larger arc—as stand-alone pieces, these work marvelously, but even collections of stand-alone masterpieces need to have a sense of continual movement through the pages. I will say this: the teasers in Anobium Vol. 1 are enough to make me want to find out. Anobium Vol. 1 is full of similarly dissimilar stories and poems, born from a contemporary, gritty version of The Twilight Zone on steroids with a Mensa IQ. Many pieces are remarkable in their uniqueness, yet they coalesce nicely as a collection. Concerning the aforementioned need for a “larger arc,” Anobium has it in spades. The selections and arrangements move through Anobium seamlessly, creating an even tenor to Benjamin Van Loon’s madhouse of literature. However, the Managing Editor (and his Associate Editor cronies) can’t take all the credit. A big part of what brings these different threads together is the volume’s artwork, designed by Benjamin Van Loon’s brother, Jacob Van Loon. Think Coen brothers meet [insert more obscure brother duo here]. Anobium’s artwork isn’t just random flare pinned to the pages; it’s part of the main show. Though Anobium bills itself as primarily a literature rag, it is fundamentally both a lit and art journal. Each page of Anobium fits seamlessly together. Big blocks of irreverent text sections off various elements of the issue, while black and white illustrations pop from the inner folds. Anobium achieves an aesthetic more refined in its B&W pages than I’ve seen in some full-color journals. Anobium achieves excellence in its inaugural issue. The literature is witty, and a large chunk of the writing pairs this with humor. The artwork blends well and works as an actual, integrated part of the volume, rather than a tacked on extra. Essentially, it’s damn good. Copies of Anobium Vol. 1 and Sebastian’s Relativityare still available. 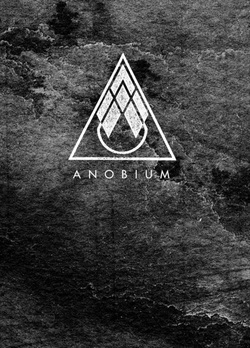 Pre-orders are currently available for Anobium Vol. 2, releasing on January 31st, 2012.